Ryanair passengers who have received compensation for cancelled and delayed flights have been charged extra fees after banks rejected the cheques.Several people said their bank had returned cheques they had received from the airline because they were unsigned.One passenger, who waited 11 months for compensation, said she was now worse off after the bank added a fee of 20 euros (Since April, more than one million Ryanair passengers in Europe have had delayed or cancelled flights, according to the airline's own figures. The latest one-day pilots' walk-out on 10 August led to the cancellation of nearly 400 flights.Ryanair, which is Europe's largest low-cost carrier, has blamed other delays on bad weather or air traffic control shortages. The Civil Aviation Authority recently stepped in to advise passengers caught up in strikes that they should apply for compensation.Known as EU261, compensation is set at 250 euros (?224) for flights of up to 1,500km (932 miles), and 400 euros (?358) for longer flights in Europe and North Africa.Businessman Gordon Fong received ?440 after his flight home from Spain in June was first diverted and then landed at a different UK airport, leaving him with a 150-mile taxi journey to his home in Bournemouth. "But when I received the cheque there was no signature," he said. "I took time off work to drive to the bank but was told by the teller I couldn't use it. I had to go back to the website to try and get them to respond and send a new cheque, but I still haven't had a reply. "The BBC has spoken to 10 other people who said their compensation from Ryanair had been refused by the bank. Karen Joyce, 50, said she spent 11 months waiting for compensation from Ryanair after her 25th wedding anniversary holiday flight was cancelled in September.Ryanair paid part of her claim but when she went to cash a second cheque it was returned by the bank - along with a 20 euro (?17.94) fee"I was totally dumbstruck. 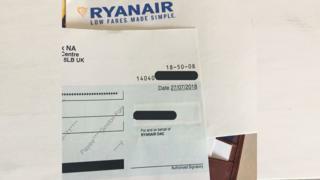 We were loyal Ryanair customers and for them to bounce the cheque as well I just thought was disgusting," she said.When Mrs Joyce, from Manchester, contacted Ryanair, she spent 20 minutes on the phone to a customer service representative. "Then he just put the phone down," she said. "I have not received anything from Ryanair." In a statement, Ryanair said "a very small number of cheques" processed in July were issued without a required signatory "due to an administrative error". It said the cheques had been "re-issued to customers along with a letter of explanation" on 15 August. "We apologise again for any inconvenience caused to customers," the airline added. Ryanair also said customers who flights were cancelled "were either refunded or re-accommodated on to alternative flights and we process all valid EU261 compensation claims within 10 working days". "Ryanair complies fully with EU261 legislation, under which no compensation is payable to customers when the (strike) delay/cancellation is beyond the airline's control. "If these strikes, by a tiny minority of Ryanair pilots, were within Ryanair's control, there would have been no strikes and no cancellations." Ryanair is in dispute with pilots in five countries.Its financial report shows that in the last year it has paid out 25m euros (?22.4m) in EU261 compensation claims arising from the disruption of its timetable last autumn.The report says EU261 costs increased as "passengers have a higher propensity to claim than in prior years".Last year, Ryanair made profits of ?1.3bn after tax. It carried 130 million passengers in 2017.